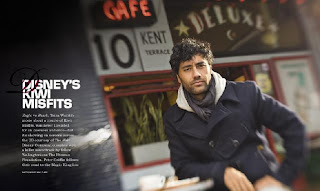 One of my most pleasant interviews of 2007 was with Oscar nominated Wellington director Taika Waititi who did the media rounds as his feature debut Eagle vs. Shark was released. We spent a couple of hours talking at Wellington’s Deluxe cafe. His movie was opening at the Embassy Theatre next door that afternoon. Here’s a link to the complete interview on the Idealog website, which is formatted in much nicer way.